Rollin' down the river with Proud Mary and her krazy krewe! 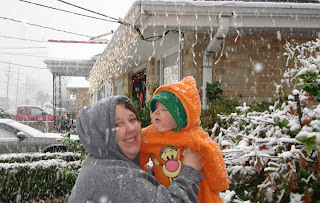 : Sneaux Day! I woke up and got ready like any typical day. I got in my car and did my usual Starbucks run before dropping Noah off at my mom's. Then all of a sudden I thought I started seeing snow...not just little specs but actual SNOW! I called Clint (who was actually home from work b/c he had the stomach flu, poor guy) for him to confirm my crazy thoughts and that I wasn't crazy. I just couldn't believe it was SNOWING! Of course...I didn't have my camera ON me. Thankfully when I got to my parents my dad had his camera out and snapped a picture of Noah and I. I then began going to work, but honestly it was quite icy/slippery and I had no idea how to drive in this weather. I called work to tell them I was running late due to the weather and they told me to enjoy the snow! Score! I then went back and got Noah and went back home. I put him in the warmest clothes I could find (which wasn't much at all) and we braved outside. I got a few cute snapshots of him. I then made 2 little snowmen...which actually turned out to look like little birds in my opinion. Oh well.